An international team of scientists led by Liang-shi Li at Indiana University has achieved a new milestone in the quest to recycle carbon dioxide in the Earth's atmosphere into carbon-neutral fuels and others materials. The chemists have engineered a molecule that uses light or electricity to convert the greenhouse gas carbon dioxide into carbon monoxide—a carbon-neutral fuel source—more efficiently than any other method of "carbon reduction." The process is reported today in the Journal of the American Chemical Society. "If you can create an efficient enough molecule for this reaction, it will produce energy that is free and storable in the form of fuels," said Li, associate professor in the IU Bloomington College of Arts and Sciences' Department of Chemistry. "This study is a major leap in that direction." Burning fuel—such as carbon monoxide—produces carbon dioxide and releases energy. Turning carbon dioxide back into fuel requires at least the same amount of energy. A major goal among scientists has been decreasing the excess energy needed. This is exactly what Li's molecule achieves: requiring the least amount of energy reported thus far to drive the formation of carbon monoxide. 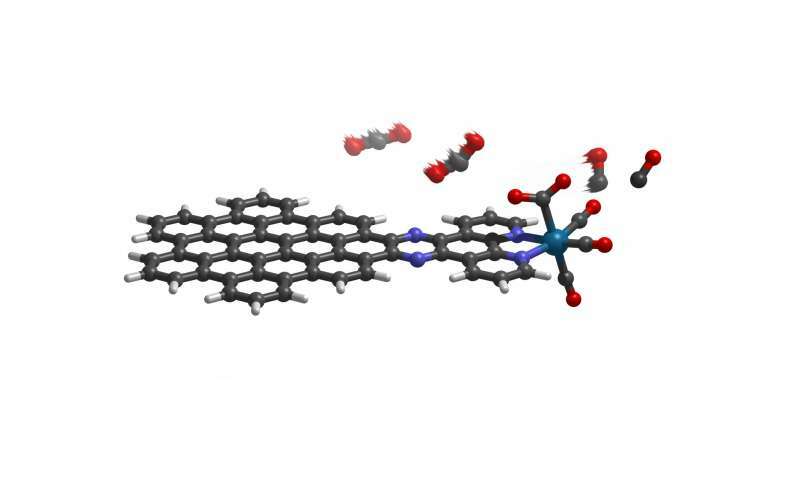 The molecule—a nanographene-rhenium complex connected via an organic compound known as bipyridine—triggers a highly efficient reaction that converts carbon dioxide to carbon monoxide. The ability to efficiently and exclusively create carbon monoxide is significant due to the molecule's versatility. "Carbon monoxide is an important raw material in a lot of industrial processes," Li said. "It's also a way to store energy as a carbon-neutral fuel since you're not putting any more carbon back into the atmosphere than you already removed. You're simply re-releasing the solar power you used to make it." The secret to the molecule's efficiency is nanographene—a nanometer-scale piece of graphite, a common form of carbon (i.e. the black "lead" in pencils)—because the material's dark color absorbs a large amount of sunlight. Li said that bipyridine-metal complexes have long been studied to reduce carbon dioxide to carbon monoxide with sunlight. But these molecules can use only a tiny sliver of the light in sunlight, primarily in the ultraviolet range, which is invisible to the naked eye. In contrast, the molecule developed at IU takes advantage of the light-absorbing power of nanographene to create a reaction that uses sunlight in the wavelength up to 600 nanometers—a large portion of the visible light spectrum. Essentially, Li said, the molecule acts as a two-part system: a nanographene "energy collector" that absorbs energy from sunlight and an atomic rhenium "engine" that produces carbon monoxide. The energy collector drives a flow of electrons to the rhenium atom, which repeatedly binds and converts the normally stable carbon dioxide to carbon monoxide. The idea to link nanographene to the metal arose from Li's earlier efforts to create a more efficient solar cell with the carbon-based material. "We asked ourselves: Could we cut out the middle man—solar cells—and use the light-absorbing quality of nanographene alone to drive the reaction?" he said. Next, Li plans to make the molecule more powerful, including making it last longer and survive in a non-liquid form, since solid catalysts are easier to use in the real world. He is also working to replace the rhenium atom in the molecule—a rare element—with manganese, a more common and less expensive metal. It looks like a great way to produce fuels, but we are starting to find consequences to these nano products used in the catalyst. What uses CO as fuel? If that was so why is there 50% more CO in the atmosphere now ? I clearly do not understand why prying the oxygen off the carbon dioxide --and using energy to do it--makes any sense at all. "What uses CO as fuel? If that was so why is there 50% more CO in the atmosphere now ? I clearly do not understand why prying the oxygen off the carbon dioxide --and using energy to do it--makes any sense at all." As is says in the article, CO is feedstock to industrial processes. In the air we have excess CO2 that is the most oxidized form of carbon.